Sore at the Manmohan Singh government's decision of scrapping Ram in the affidavit filed in the Supreme Court on September 11, the veteran CPM leader, Jyoti Basu alleged that the Congress had now started playing with Ramlala as their poll-card. In the hope of keeping the issue alive for political gains, the Bharatiya Janata Party today remained firm on its demand of an apology from Prime Minister Manmohan Singh and Congress chief Sonia Gandhi for the controversial affidavit on Ram Setu and described its withdrawal as the result of Hindu outrage. Heads rolled in the government in the wake of the controversy over the Supreme Court affidavit on Ramsetu with two senior officials of the Archaeological Survey of India being suspended. Bakshi and Chandrashekhar were put under suspension following the inquiry conducted by ASI director-general A Vaish, sources here said. Punjab was adjudged as number one state in the country at the fifth ‘India Today State of States conclave’ here today. According to a spokesman, Punjab scored on the major parameters of growth and development, including management of macro economy, agriculture and infrastructure development. Punjab Chief Minister Parkash Singh Badal has demanded a minimum support price of Rs 836 per quintal for paddy for the current procurement season. Badal, who met agriculture minister Sharad Pawar here this afternoon, urged the Centre to announce MSP immediately as procurement process had started in Punjab. The Supreme Court will hear the petition filed by two opposition MLAs of the Goa Assembly on September 24, challenging the order of Speaker Pratapsinh Rane restraining them from voting in any proceedings in the House. Bihar Chief Minister Nitish Kumar today ordered a probe by the CID into the lynching of 10 suspected thieves by a mob of about 300 people in Vaishali district yesterday. The police managed to rescue one thief of the total 11, who is now battling for life after being admitted to the Patna Medical College and Hospital in a critical condition. 6 million say no to unwanted calls. Movies fail to woo audiences. Talking to mediapersons at the Alimuddin Street party office, the senior leader said they did not approve of the UPA's filing of the affidavit by scrapping Ram as non-entity. The veteran leader said the CPM would finally decide on the question of withdrawal of support to the government in the forthcoming politburo and the central committee meeting to begin in Kolkata from September 28. He said initially they decided not to withdraw the support and invite a snap poll at this stage. But now they needed to give a serious thought to the issue of support to the government. He said he was not surprised that the Ram controversy had been brought to the forefront by mentioning Ram's name in the affidavit merely as a mythological figure. But there was no need as such to unnecessarily scrap Ram while deciding on the construction of Ram Setu. It seemed they had been preparing themselves for a snap poll in the Lok Sabha and accordingly, the Lord Ram controversy was brought in, which the BJP had been monopolising for so long, Basu said. He alleged that both Sonia Gandhi and the Prime Minister, Manmohan Singh had been acting arbitrarily, ignoring the importance of the Left parties. The former Chief Minister was attending the party's state committee meeting today which was held to discuss and review the present political situation vis-à-vis the nuclear deal. The meeting also dealt with the poll strategy that the party would adopt in case the UPA government fell and a poll was held. The CPM today attacked the BJP for opposing the Ram Setu on religious grounds as “sheer hypocrisy” as Vajpayee government had sanctioned the project. The withdrawal is no abatement of the seriousness of the issue. We regard this affidavit as a crime and blasphemy. Both the Prime Minister and the Congress chief owe an apology to the country, BJP spokesman Prakash Javadekar said here. It (government) withdrew it only after there was widespread outrage, he said, insisting that the government was required to fix Ministerial accountability for the affidavit. However according to a PTI report the Congress rejected BJP's demand for an apology from Prime Minister Manmohan Singh and party President Sonia Gandhi for the government affidavit in the Supreme Court on Lord Ram. "Since the matter has been immediately rectified, there can be only kudos and not criticism," Congress spokesman Abhishek Singhvi said at the AICC briefing. Heads rolled in the government in the wake of the controversy over the Supreme Court affidavit on Ramsetu with two senior officials of the Archaeological Survey of India being suspended. Bakshi and Chandrashekhar were put under suspension following the inquiry conducted by ASI director-general A Vaish, sources here said. 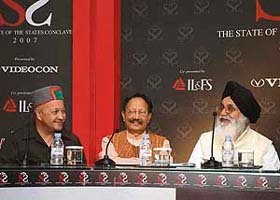 Punjab was adjudged as number one state in the country at the fifth ‘India Today State of States conclave’ here today. According to a spokesman, Punjab scored on the major parameters of growth and development, including management of macro economy, agriculture and infrastructure development. Sukhbir Singh Badal, MP, said the award should silence those, who had been criticising the progressive policies of the state government. Haryana Chief Minister Bhupinder Singh Hooda too called for adequate increase in the minimum support price (MSP) of various agricultural crops in view of the increasing cost of agricultural inputs. He said keeping in view the interests of the farming community, the Contract Farming Act has been implemented so that the farmers get remunerative price for their produce. Hooda said steps have been taken to mitigate the problems of farmers by reducing the rate of interest on crop loan from 11 per cent to 7 per cent as also by waiving interest on payment of outstanding loans. The state economy, he said, has witnessed an excellent growth of 12.6 per cent in gross state domestic product over the last year’s level at current prices. Punjab Chief Minister Parkash Singh Badal has demanded a minimum support price of Rs 836 per quintal for paddy for the current procurement season. Badal, who met agriculture minister Sharad Pawar here this afternoon, urged the Centre to announce MSP immediately as procurement process had started in Punjab. Sukhbir Singh Badal, MP, who accompanied the Chief Minister, demanded a MSP of Rs 1,200 per quintal of wheat for the ensuing season. He said early announcement of enhanced MSP of wheat would bring more areas under its cultivation and help meet the rising demand. The Chief Minister, who supported Sukhbir's demand, said instead of squandering foreign exchange on import of wheat at exorbitant prices, the Centre should spend the money to encourage domestic producers. According to an official spokesman, Pawar assured Punjab leaders that Centre would consider their demand "favourably and expeditiously." The Chief Minister also raised the issue of "value cut" imposed by the Centre on the paddy procured last year, resulting in a loss of Rs 40 crore to the farmers of Punjab. He said there was no justification for value cut. A bench headed by Chief Justice K G Balakrishnan issued notices to the Goa government and Congress MLA Angel Fernandes, who had filed the petition before the Speaker, seeking disqualification of Maharashtra Gomantak Party (MGP) members Sudin Dhavalikar and Dipak Dhavilkar. Senior advocate Mukul Rohatgi, who mentioned the petition of Dhavalikar brothers before the Bench, questioned the Speaker’s final order contending that it was contrary to the judicial discipline and propriety as the apex court had already reserved its verdict against his interim order. The Speaker in his interim order on July 30 had barred the two MLAs, who then had sided with the BJP-led opposition, to vote on the confidence motion moved by Chief Minister Digambar Kamat. The apex court while reserving its judgement had questioned the procedure adopted by the Speaker in passing the interim order before the crucial floor test when the number game had allegedly tilted away from the ruling party. Rohatgi said the action of Speaker when the judgement was reserved amounts to overreaching and attempting to subvert the proceedings before the apex court. The MGP MLAs said the action of the Speaker was illegal and unconstitutional and contrary to the principles of Parliamentary Democracy. Bihar Chief Minister Nitish Kumar today ordered a probe by the CID into the lynching of 10 suspected thieves by a mob of about 300 people in Vaishali district yesterday. The police managed to rescue one thief of the total 11, who is now battling for life after being admitted to the Patna Medical College and Hospital in a critical condition. After reviewing the situation in the area at a high level meeting with senior police officials, Nitish asked the CID to probe into the case. He was reportedly upset over the alleged apathy of the local police to take note of the complaints of the people regarding frequent thefts at Dhelpurwa village that led to the shocking incident of street justice yesterday. While the probe began today, Nitish asked the additional director general of CID Yashwant Malhotra to camp at the site along with forensic experts. He set four-day deadline for Malhotra to submit a detailed report to him on the incident that invited widespread criticism of his government. Besides, IG (HQ) Anil Sinha would conduct a separate inquiry into administrative lapses leading to the brutal killings. An FIR was already registered against 300 odd unknown persons in connection with the incident. Nitish has also convened a special meeting tomorrow to review a spurt in the cases of people taking law into their hands leading to instant street justice. The villagers in Vaishali justified their act by claiming that the group of 11 were burglars who had been giving them sleepless nights for the past few months. On September 3, three youths were brutally beaten by a mob in Nawada district for allegedly snatching a motorcycle. On the same day in the district, two boys were beaten and tonsured by a mob for allegedly stealing detergent powder from the storage shed of a shopkeeper.